I’m in the middle of a large project with a global industrial company. I just spent the last hour reading interview notes from firsthand interviews of people on work sites around the world (mainly Europe and Africa). It turned out that many of the floor-field workforce were much more sophisticated in their use of digital tools than their desk-office counterparts. Although they were not mobile-equipped by their employers, they were very much into digital communication and socializing on the personal level. A big pain point is the slow 3G connectivity on work sites. That’s also my big complaint as a nomad worker when I travel on the modern, high-speed train from Avignon to Paris. I can get email and text messages only at rare, infrequent intervals during the 3-hour one-way trip. And this is in France, a theoretically connected country where the biggest mobile providers have been advertising 4G on prime time -TV in the evenings. When I see those ads I think – let’s just get 3G operational! And when I work with companies like my industrial client, I think let’s get people mobile-equipped! 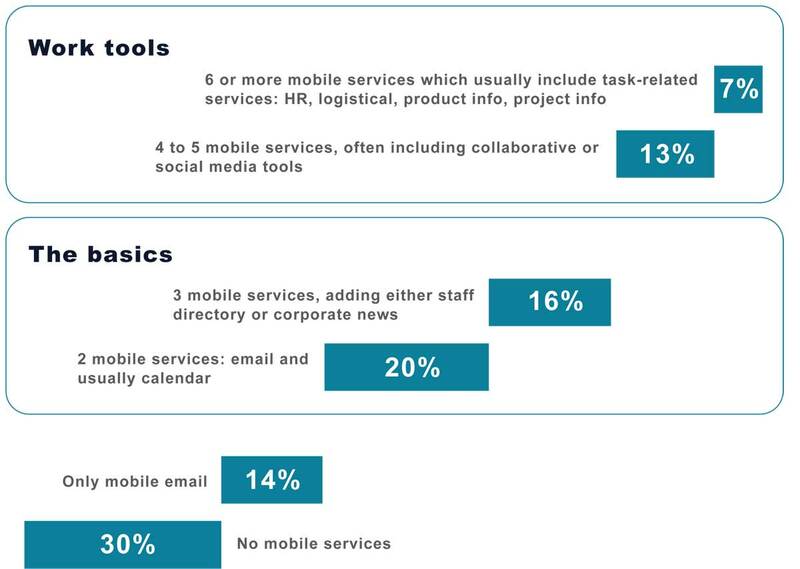 Data from Q3-4 of 2012 (published in January 2013) showed that few people have access to significant mobile services for work purposes.